I talked about the DS1620 in a previous post. Now I created a DS1620 library for Arduino that has a more object oriented interface. The library has to be unpacked in the $arduino_home/hardware/libraries directory. 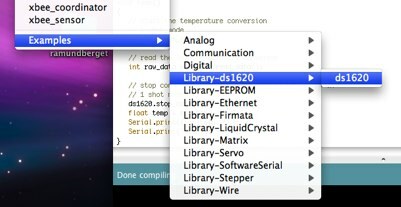 After unzipping the library you should end up with a $ARDUINO_HOME/hardware/libraries/ds1620 directory. The library contains an example that can be accessed through the File ⇒ Sketchbook ⇒ Examples ⇒ Library-ds1620 ⇒ ds1620.